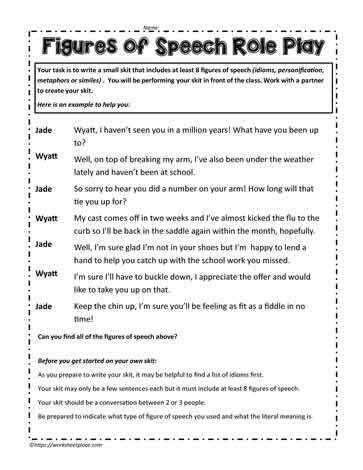 A great activity to teach students about figures of speech. They create a skit. Your task is to write a small skit that includes at least 8 figures of speech (idioms, personification, metaphors or similes) . You will be performing your skit in front of the class. Work with a partner to create your skit. Wyatt, I haven’t seen you in a million years! What have you been up to? Well, on top of breaking my arm, I’ve also been under the weather lately and haven’t been at school. So sorry to hear you did a number on your arm! How long will that tie you up for? My cast comes off in two weeks and I’ve almost kicked the flu to the curb so I’ll be back in the saddle again within the month, hopefully. Well, I’m sure glad I’m not in your shoes but I’m happy to lend a hand to help you catch up with the school work you missed. I’m sure I’ll have to buckle down, I appreciate the offer and would like to take you up on that. Keep the chin up, I’m sure you’ll be feeling as fit as a fiddle in no time!